It's been quite a while since I've read a James Patterson book that I actually liked. I wasn't the fondest of his Witch and Wizard series, so I approached his newest YA series with no real expectations - which is probably a good thing as I'm not quite sure how to feel about this one. Given that Confessions of a Murder Suspect is a collaboration between James Patterson and Maxine Paetro, I was expecting something along the lines of their Women's Murder Club series: murder mysteries with enough suspense to keep you completely absorbed in the story. Unfortunately, that wasn't quite how my reading experience went. Confessions of a Murder Suspect is narrated in such a way that it feels as though Tandy is speaking directly to the reader. It made the reading experience feel like Tandy was taking you directly into her confidence and sharing her story in real life, which was neat. The only problem with this, though, is that she jumped around a lot in her narration. She would hint at a surprise and say that she'd tell you about it later, which was probably meant to build suspense but instead got kind of irritating after a while. From the beginning, I was intrigued by our self-confessed unreliable narrator, Tandy, and the notion that Tandy or any one of her siblings could be responsible for the murders. The Angel family members all had incredibly distinct personalities, and the strange customs in the family were certainly entertaining to read about. A mixture of these eccentricities and sociopathic tendencies kept me wondering exactly what made them this way -- were they a product of their environment, complete with unique reward/punishment systems, or was a result of something more? Since Confessions of a Murder Suspect is, ultimately, a murder mystery, I was expecting a much better resolution than the one that we were given. It was a bit of a let down, even though it was unexpected, and there were so many loose ends that were unresolved. It conveniently sets the stage for the sequel, although I would have much preferred it to end like the Women's Murder Club books (at least, the ones that I've read) do: at the end of the book, the mystery is solved, and the next book in the series has a new mystery to focus on. 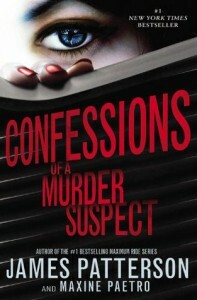 Overall, Confessions of a Murder Suspect was a pretty good read. It held my attention for most of the story and even entertained me at times, but a few problems with the narration and the way that it ended kept me from enjoying it as much as I would have liked to.